Okay, so now that’s out of the way. 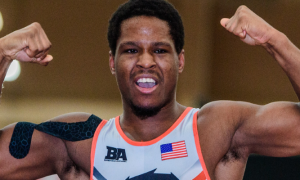 The 2019 Grand Prix Zagreb Open, United World Wrestling’s first “Ranking Series” event of the year, has come and gone with two United States medal winners — Xavier Johnson (63 kg, Marines, silver) and G’Angelo Hancock (97 kg, Sunkist, bronze). 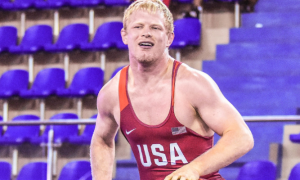 Four other Americans were also in position to potentially contend for podium spots, but unfortunately, all four were defeated in their respective repechage matches. For Johnson, it’s his second straight medal from Croatia. Last year, he bounced back from an early loss to two-time Junior World Champion Kerem Kamal (TUR) and wound up going for bronze — against Kamal. The pair wrestled twice. In their first bout, Kamal tech’ed Johnson. The second time around, Johnson head-wrapped Kamal and decked him in the first period. On Saturday, Johnson didn’t just beat two experienced foreigners, he majestically obliterated them. Leading Irakli Dzimistarishvili (GEO) 7-0 in the opening period thanks to a passive, lift, and correct throw, the only way Johnson figured to lose that match was if he somehow fell asleep at the wheel. Instead, Dzimistarishvili went for a throw of his own and the Marine easily landed on top to nail down the fall. His semifinal against Dawid Ersetic (POL) was strikingly similar. Passive, gut, lift — and then once back standing — Ersetic attempted a throw, and Johnson pasted him right then and there. The final didn’t pan out spectacularly. 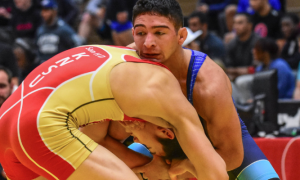 2015 Junior World bronze Islomjon Bakhramov (UZB), who had earlier defeated 2018 US U23 World Team member Travis Rice (IRTC), was just a step too technical. It wasn’t the par terre points. It was the takedowns. Bakhramov took advantage of two positional miscues that directly resulted in points on the mat. But with that comes a glittering silver lining: those issues on the feet for Johnson against Bakhramov are certainly correctable. Even with a(nother) weird loss to Ilya Borisov (RUS), Hancock’s total performance was extremely encouraging. Abolfazi Seyedmahdavi (IRI), his first opponent on Saturday, never knew what hit him. Hancock executed a lift, and Seyedmahdavi just couldn’t escape off of his back. Lee Sey-Yol (KOR) was different. He is an experienced professional and likely knew enough to know that if he opened up, he would pay for it immediately. A frustrating match to watch at times, if only because Lee seemed so disinterested in adequately engaging. Credit goes to Hancock for adjusting enough to deal with it, and then for mercilessly pouncing on Lee near the edge in the second period, which sealed the match. But it was against last year’s Zagreb champ, Adam Varga (HUN), when Hancock really shined. 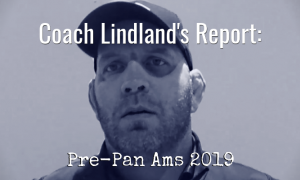 Front to back, it was his most complete match since the 2018 Pytlasinski (where he defeated World/Olympic star Artur Aleksanyan of Armenia, but also dominantly shut down Bulgaria’s Nikolai Bayryakov for gold). 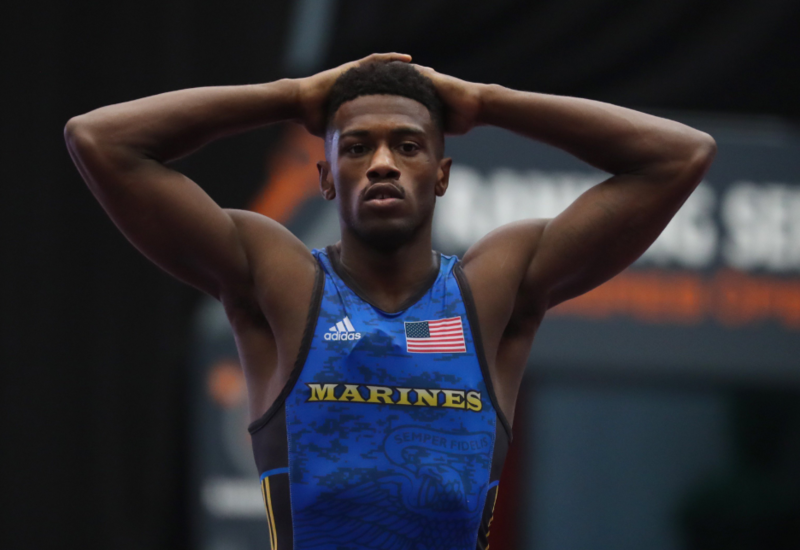 Hancock earned both passivity/par terre chances in the bronze round, a verifiable rarity for US athletes. And on that second shot, he snared a beautiful front headlock and rolled it over the top en-route to a 4-1 decision. The second “Ranking Series” tournament on the calendar, the Hungarian Grand Prix, takes place February 23rd-24th. As you likely already know, the US will be in Europe training leading up to that event. For many of the athletes who did not accrue points in Zagreb, Györ could be their last shot depending on how their schedules are laid out through the remainder of the season. They have been down this road before. 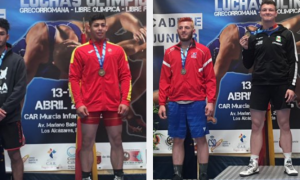 Last week, Alston Nutter (63 kg, Sunkist/OTS) and Benji Peak (67 kg, Sunkist/OTS) both traveled by themselves (i.e., without any other US teammates) to Blagoevgrad, Bulgaria for the 2019 Ivan Iliev, a U23 tournament. It’s a situation that harkens back to the fall of 2017. That’s when Nutter and Peak hopped over to Denmark for a camp and a tournament before later meeting up with the US delegation in Sweden. On Thursday, Nutter took a forfeit win against Lucas Oudy (FRA, more on him in a second) but fell in the next round to Miljan Djukanovic (SRB) 4-3. 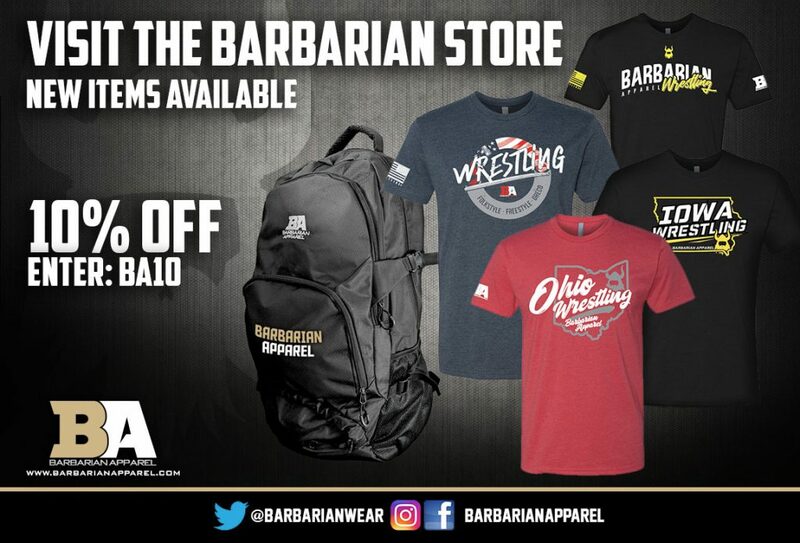 Peak didn’t wrestle until Saturday. 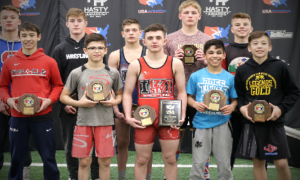 His first opponent was University World silver medalist Bence Balatoni (HUN) and the Wisconsin kid was leading by one in the second until Balatoni got two for a correct throw and added a step-out later on. Balatoni advanced to the final yesterday, thereby pulling Peak back into the repechage. Despite another outstanding effort, it wasn’t his whose hand was raised. Oudy, who was originally supposed to wrestle Nutter at 63 kilos on Thursday, had bumped up and got past Peak via an 8-8 criteria decision. Peak, who with Nutter just linked up with the Senior squad for training camp overseas, took a time-out earlier this afternoon to answer a few questions about his trip. 5PM: Both matches in Bulgaria were tough, but they were against good opponents. At this stage of the season, is that more important than the results? Benji Peak: I lost both matches because of my conditioning, I’m just coming back from bronchitis. I had bronchitis for a month and then jumped right into this competition. 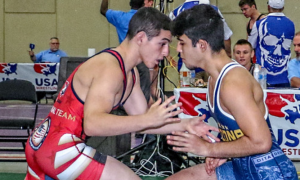 I wrestled the Dave Schultz tournament coughing and barely able to breathe. Now at this tournament, I realized I just need to get my conditioning up and I win both my matches. 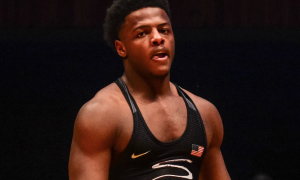 So at this point of the season, I am fine with how my matches went, and when I wrestle them again, I won’t be gassing out in the second period. 5PM: Obviously, a lot of people were fixated on your weight last year. Now you are up at 67 and have had a handful of matches there. You also had that big win against Hayden Tuma in the Schultz. Do you feel as good as it looks like you do? Peak: I walk around at 70 kilos, and that’s kind of funny because I weighed the exact same last year, so this is a lot different to not be cutting a lot of weight. I am having more fun and just trying to grow into my body. And beating Tuma was a big win for me, for sure. I felt really comfortable when I saw I had to wrestle him because Army was just at NMU like a week before, and I got to wrestle him a lot when he was there. I have a lot of respect for him and he is now one of my friends, and can’t wait to wrestle him again. But it is definitely one of the biggest wins of my career. 5PM: Big week of training for you. Are there any specific items in your head that you approach overseas camps with? Peak: Yes, learning how to really pummel and stay in the center. I feel like my down fall in Greco right now is that I reach too much, and I get pushed around a lot. I need to get that passive call first and end the match early. And I feel like this will be a great camp to practice doing that. A squad of Northern Michigan-Olympic Training Site athletes will be taking on members of the All-Navy team Wednesday evening, and you will be able to watch it all unfold live. Navy — where NMU/OTS head coach Rob Hermann coached for 27 years prior to coming to Marquette — has been practicing with the OTS athletes since late January in advance of the Armed Forces Championships later this month. The dual meet on Wednesday will consist of both international styles — primarily to give the Navy wrestlers an added dose of preparation for the aforementioned Armed Forces. Confirmed rosters are not available as of yet, but we hope to bring those to you before the match on Wednesday. Here is the link to the free live stream. Admission to the event is free. A DJ will also be on-hand to provide entertainment throughout the evening.